The fabric softener brand hits the nail on the head by using contests and sweepstakes to connect with their influencers. You would think that being a fabric softener brand would have limit their ability to talk about anything more than laundry but they used their boards to strategically cultivate a feeling they want their consumers to feel when thinking of their brand and they successfully do it with their Pinterest account. Boards we love: Their “#ClosetLoveAffair” board perfectly combined consumer participation by coaxing them to enter their sweepstakes as well as inspiring them with outfit ideas. Genius. 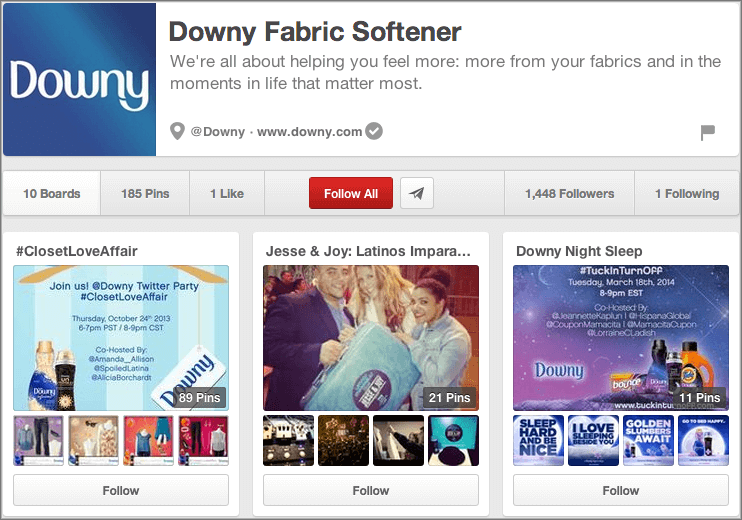 Much like Downy, Dove’s Pinterest account evokes a feeling. The personal care product giant has a Pinterest account with boards that are littered with pins about leading a balanced life as well as inspirational words and quotes, stamping their beliefs on what beauty is. Boards we love: We can’t get enough of their “Beautiful Balance” board that highlights beauty tips, life lessons, thoughtful advice and caring inspiration promoting a balanced lifestyle. There’s also a “Treat Yourself” board with posts from their domain which illustrates ChiefMarketer.com‘s point of using their Pinterest account like their own website. Ziploc’s Pinterest account is an avid pinner’s dream. Full of crafty, DIY ideas they very tactfully integrate their product into their pins, with plenty of food recipes and other fun, family-friendly activities. Boards we love: We are all about life hacks, and their “Life Made Easy” board has plenty of interesting, cool ideas to help us “MacGyver” our way through a sticky situation. As you can imagine, the chocolate giant’s Pinterest account is filled with chocolate. Recipes with chocolate in all forms; cooked, baked, stuffed, rolled, dipped. It’s basically the mecca of chocolate. The amazing thing about their account is that they are not making any qualms about having their Pinterest the go-to account for all things chocolate, cementing their brand status as chocolate connoisseurs. Boards we love: There’s so many to choose from but if you are looking for chocolate recipes, the board to check out is the “HERSHEY’s Baking Library.” With YouTube’s video integration, you can now check out recipe videos from their official YouTube account on Pinterest. The original dijon mustard, Grey Poupon’s Pinterest account perfectly integrates almost all the points raised by ChiefMarketer.com, by curating content from the history of their brand to highlighting the different flavors. Boards we love: There’s so many creative boards to choose from: “The Art of Sandwich” if you need recipe ideas on how to spread your Grey Poupon; “Prized Pets” because everyone loves animals on Pinterest; “Pardon Meme” a hilarious board of pins consisting of Poupon memes that will make the child in you laugh with glee. Also, in case you haven’t seen this, check out their NSFTV commercial. Don’t watch it at work – you won’t be able to stop yourself from LOL-ing. Know of any other CPG brands with awesome Pinterest accounts that we missed? Drop a link on our comment box and share them with us!